Fixed — although it appeared in the Sunday Times first. FixMyStreet.ie run by not-for-profit organisation, MyGov, who also run KildareStreet.ie. 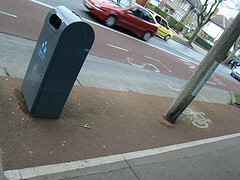 FixYourStreet.ie run by South Dublin County Council on behalf of the government. Or if you live in Northern Ireland you can have the pleasure of using the original and superior fixmystreet.com, run by UK charity mySociety. With all three sites you can report cycling-related issues such as road defects, street lighting, and tree maintenance. As well as not-so-cycling-related issues such as graffiti. The UK site has a greater range of categories which are useful to cyclists, including issues with traffic lights, road signs, and obstructions. Using a website to report a problem is useful, but where these services are often best when you can use your phone to auto-detect the exact location of the problem and photograph the issue. All of the services have apps which run on Android-based phones, but only FixMyStreet.com has apps available for the iPhone and Nokia smartphones. FixMyStreet.ie comes close second place with a fully-functioning web-app — you just have to visit the site on your phone to use the web-app. We tested it on an iPhone. The State-run site has a usable web-app but it has no auto-locate or image upload functions. If you report something will a problem be fixed? My personal experiences and that of users of sites such as boards.ie is mixed — some problems will be fixed quickly but others may be left unresolved. If a problem remains unresolved, complaining to your local councillor can sometimes work. Most councils will also have old-fashioned phone numbers to report problems and many, like Dublin City, have their own ‘report a problem’ sections on their websites. For cars parked illegal in cycle lanes or clearways, Dublin City’s clamping contractor have their own phone number. Wouldn’t it be great if it was just one comprehensive reporting site and app for all of these things? For now, we can only dream. There is also an international open source website called http://www.SeeClickFic.com which has apps for iPhone, Android and Blackberry (not sure about windows) and a mobile version which works on any mobile device browser. fixMyStreet.com was the original a number of years ago in the UK, and is post code based. SeeClickFix built on the idea by connecting it to google maps, and adding the people power voting bits. FixMyStreet.ie was ink development when the government decided at the last election to come up with their own, which is of course the least useful. the biggest problem is that they have not yet found a way to ensure that council staff are legally obliged to acknowledge and reply to issues within a reasonable time. Don’t forget http://fixmyarea.com/ – iphone and android apps both available. Thanks Tommy, funny enough I came across that site this morning.